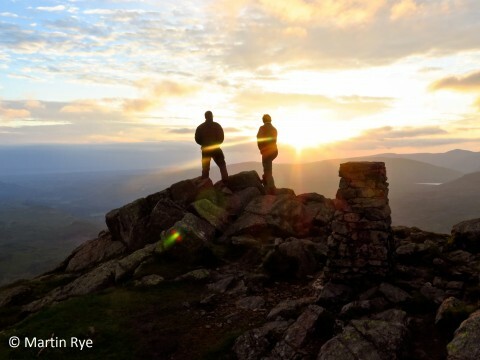 Congratulations to Martin Rye whose photograph taken on the summit of Harter Fell in the Lake District has been selected as the winner of the #viewspiration competition, celebrating the launch of ViewRanger 6. In A Pictorial Guide to the Lakeland Fells (Book 4) Wainwright commented: “Not many fells can be described as beautiful, but the word fits Harter Fell, especially so when viewed from Eskdale.” We think it’s a great spot to watch the sunset over the western fells too. Martin wins a Nexus 7 tablet preloaded with 1:50,000 scale Ordnance Survey mapping for the whole of the UK! ViewRanger 6 – the latest version of the app which features a major upgrade designed to make it the simplest way to find trails to explore – was unveiled on 20 March at the Sheffield Adventure Film Festival (ShAFF) and in France at the Destinations Nature show. ViewRanger 6 combines a fresh visual approach and redesigned layout to make the app’s high-end GPS capabilities more accessible to everyone. Just the first in a series of developments that will be rolled out in the coming months it’s the start of a new journey for ViewRanger, building upon a well established reputation for reliable outdoor navigation, helping more people make better use of digital technology to discover the great outdoors at home and abroad. The update is being rolled out gradually on Android as we speak, with Apple following closely behind. Keep you eye on your email or our social media channels (Facebook, Twitter, Google+) for news of ViewRanger 6's arrival!